Ingenero is a unique game system in that it doesn't try to create a structure for the narrative recreation of life. It tries to create a structure for the narrative creation of drama. So your character has these proficiencies or experiences that you have documented. For example Joe, a free lance hooligan, has "Dashing Rogue" at level 3. This means that he gets to roll 3 dice on any task where being generally agile, sneaky, and somewhat stabby is applicable. It's a very general skill, but it is supposed to be flexible. When there's a challenge, Ingenero keeps the modifiers simple. You determine which proficiency is relevant, and you throw that number of 10 sided dice. Most of the time you'll be rolling against active opposition, so generally it's a game of "who can roll the highest number." You receive a fixed bonus, +1 or +2 to your roll if you are using a Signature Play, and you can bid points from your body or soul stat (for an additional +1 or +2). This last bonus represents your character taking a deliberate risk. If they fail the roll, not only do they fail their attempted action, but their body or soul is reduced by the value they risked for the remainder of the challenge. There are very few other bonuses and penalties to apply after that, and are strictly situational. When characters are in conflict, Players are Non-Players alike, there are a few "types" of actions they can take against each other. There are Execute actions, where a character is trying to get something done. In this case, Joe is trying to flip that switch. If he does, it will dump a truck full of cats over a waterfall (he's a jerk). Fritz the Nazi is trying to Cross Joe (also a bad guy, but his niece's cat is in the truck). And Bob the hireling is trying to block Fritz from blocking Joe (also a Cross). This is kind of complicated, but it cleans up well. Actions are resolved in order of interaction... which means we start with the bottom of the chain. Bob makes his roll against Fritz's "Shoot him in the knee" roll. Let's say Fritz beats Bob. In this case, Bob's Cross doesn't interfere, and Fritz' action goes off as planned. His same roll is then matched vs Joe's epic switch flipping skill. This is why the system is more narrative than real. 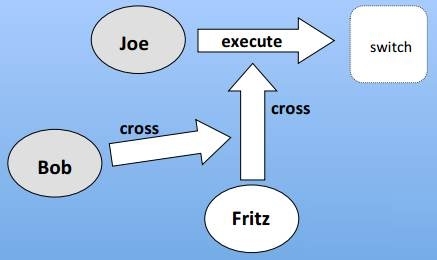 Because it's a Cross action, if it's successful, it means that Joe will not be able to flip the switch (it doesn't deal damage, and it grants a hefty advantage bonus to Fritz's next action). If it were an Execute action, it would do damage, but not block Joe's action. Fritz rolled his "Nazi Soldier 4" trait vs Joe's "Dashing Rogue 3" trait. Franz rolls higher, Crosses Joe. Joe takes a superficial would (no damage) but it hurts enough to stop him in his tracks. It's just that easy. The other actions players can do are Counter actions, specifically blocking an attack against them, and Resist actions, which are purely defensive, and grant an additional +1 bonus. And just to air the dirty laundry there's a -2 penalty for trying the same thing against the same opponent during the same challenge. That being said, the penalties and bonuses are simple to keep track of. Shooting each other is all well and good, but things change a little when things get dramatic. My next post will cover how Ingenero moves between Challenge and Story phases, and what that means for play.